Prior to undergoing migraine nerve decompression surgery in December 2017, I had a strong sense that my headaches were related to some kind of structural problem in my neck. This is part of what made me a good candidate for migraine surgery in the first place. And during migraine surgery, Dr. Ziv Peled discovered so much damage and compression in my greater, lesser and third occipital nerves that he paused to take photos. 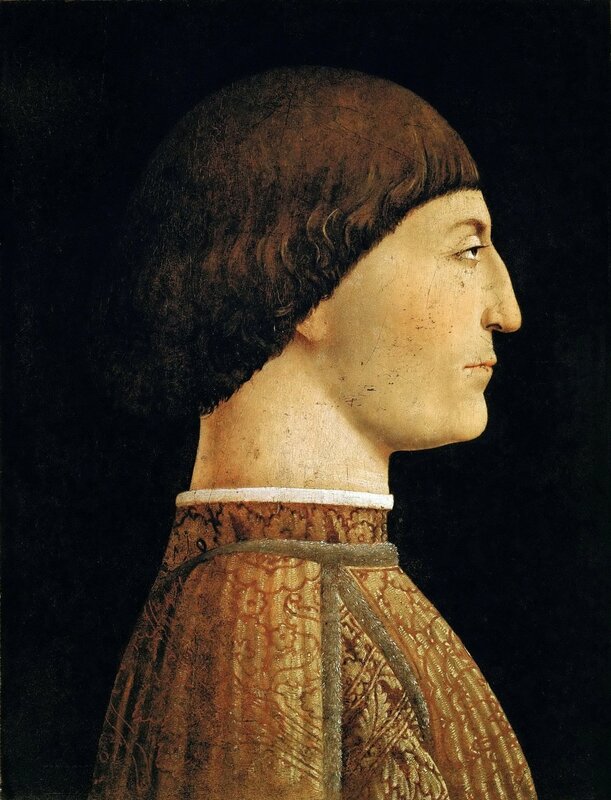 Evidence from surgery proved that posture-related neck damage really was the primary trigger of my chronic migraines. But I became interested in the connection between posture in migraines in 2011 as a senior at Bates College, at least 4 years before migraine surgery provided photographic evidence for this connection. At the time, I began observing that my headaches were worst after long bouts of intense reading or working on the laptop. Spending hours cranking my neck toward a book or screen left me with soreness in my neck and shoulders that would blossom into an all out migraine the next morning. The smoking gun was a migraine that developed during a long bus ride from Lewiston, ME to New York City, when I was hunched over my laptop very uncomfortably for several hours. The causal connection between certain postures and my headaches was undeniable. In the summer of 2012 after doing some online posture research I acquired my first copy of Esther Gokhale's 8 Steps to a Pain-Free Back and was hooked immediately (her name is pronounced "go-clay"). I was confident that this manual would lead me to a headache free life. It did not, and a big reason why is Gokhale's neglect of tongue posture. Gokhale's Theory of "Primal Posture"
In 8 Steps to a Pain-Free Back, Gokhale documents her travels to various less-developed countries where the rate of back pain is negligible as compared to that of the United States where "approximately 80 percent of individuals in the general population will have at least one episode of low back pain during their lifetime" (p. 6). How can the people of Burkina Faso, Thailand, Brazil, India and Portugal have little to no back pain while Americans suffer back pain in jaw-dropping numbers? Gokhale posits that the people of pain-free countries share something very important in common: healthy posture. Entire cultures of pain-free people living in different continents thousands of miles away from each other all shared the same exact posture, and it was very different from the posture of most Americans. Gokhale dubbed it "primal posture," because she believed it to be part our evolutionary heritage. It's the posture our paleo ancestors would have had. You can think of Gokhale's theory as the paleo diet applied to human biomechanics. This is part of the reason it clicked with me immediately. I had been dabbling in paleo lifestyle philosophy since 2010 when I read Mark Sisson's The Primal Blueprint, and I ate up Gokhale's underlying premise that health and well-being is the natural state of humans, and that morbidity is usually the result of violating rules set by nature. The purpose of this post is not to teach you the Gokhale method. You'll need a copy of her book for that. It's filled to the brim with images of people who exemplify her posture, and you'll learn best by studying those images and letting your mirror neurons go to work. For now, I'll provide a brief synopsis so you'll have context for the rest of the post. 1) Anteverted Pelvis - According to Gokhale, "pelvic anteversion is the foundation of a healthy human frame, affecting the placement of every other part of the body" (p. 20). To achieve an anteverted pelvis, tip your pelvis forward. Here's how to do it: imagine that you have a tail. Now instead of sitting on your tail, tilt that pelvis and stick your tail out! 2) Gently Curved, Elongated Spine - According to Gokhale, "the ideal shape of the spine is a gentle, elongated curve, not an exaggerated "S” curve. Pronounced curvature should occur only at L5­S1 at the base of the spine" (p. 21). 3) Neck Elongation - The neck is elongated rather than compressed, and an imaginary line from the center of the ear to the tip of the nose is angled downward. These four characteristics are maintained in every posture and movement, from lying and sitting to standing, walking and bending. 5 Years Developing Gokhale's "Primal Posture"
From the moment I opened 8 Steps to a Pain-Free Back until the present day (over 5 years and counting), I have been developing the various sitting, standing, walking and lying postures advocated by Gokhale. And I have had fantastic results. Primal posture has changed my life. It has given me strength, flexibility and endurance that I never knew before 2012. Transforming your posture is a long, slow process that requires a tremendous amount of moment-to-moment mindfulness, and a Tom Brady-like level of bodily self-awareness. 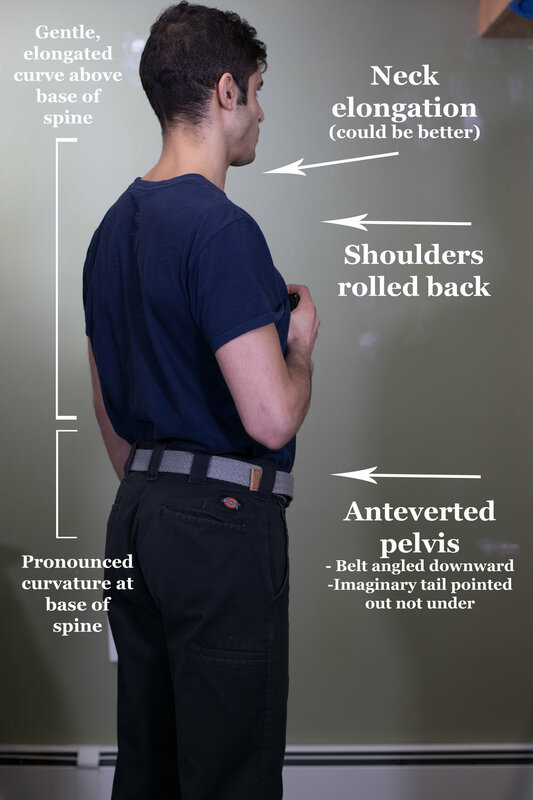 Rebuilding posture is a matter of both strengthening postural muscles that have atrophied over a lifetime of slouching while also developing length and flexibility in areas that had stiffened up around the slouch. I would sit in meditation for 15 minutes to an hour with the sole goal of holding proper posture. I would put on a movie and divide my attention between the film and my posture work. I drove across country and back twice between 2013 and 2016 and spent the entire drive mindful of my posture. From 2013-2016 I spent over 16 months living full-time at Buddhist monasteries where I was provided ample opportunity to focus on my posture. And I did. Within 2 years of beginning my Gokhale-based posture work (by 2014), I felt as if I had habituated most of her method. I was holding a pelvic tilt and elongating my spine in all postures without thinking about it. Indeed, it became too uncomfortable for me not to tilt my pelvis, elongate my spine, and roll back my shoulders. As soon as a slouch set in, my body would involuntarily respond by shifting to a more elongated position. But no matter how much I worked at it, there was one Gokhale teaching that I could not develop: healthy neck posture. During the first 5 years developing primal posture, I worked diligently to cultivate what Gokhale calls an elongated neck. As I mentioned above, since at least 2012 I was well aware that activities that strained my neck were triggering migraine headaches, and this was my motivation to fix my posture in the first place. The pelvic tilt and spinal elongation from the shoulders down became second nature in about two years. But neck elongation eluded me. The image below was taken in 2016 after 4 years of intensive Gokhale method training. Notice how everything except for my compressed neck conforms to Gokhale's primal posture. 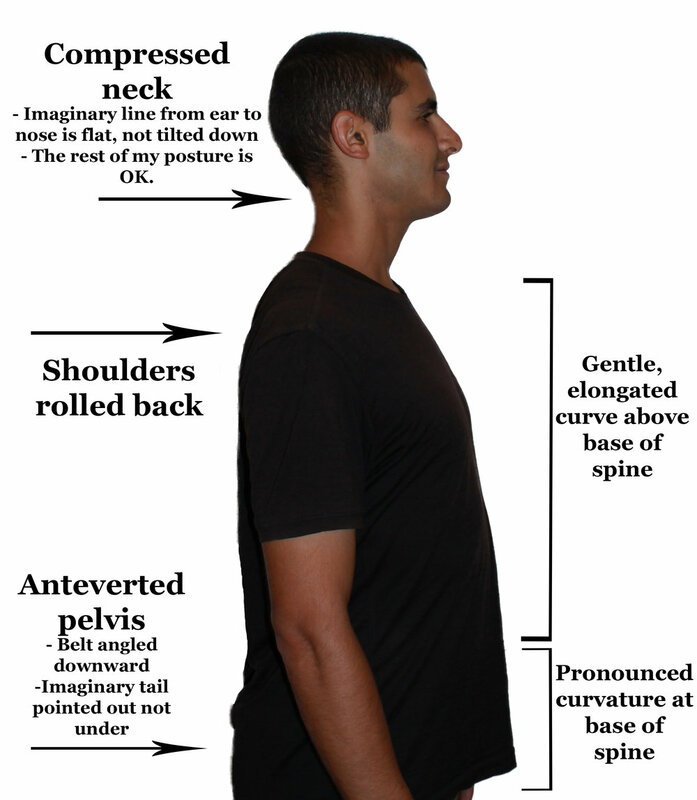 No matter how hard I tried, I could not habituate ideal neck posture. 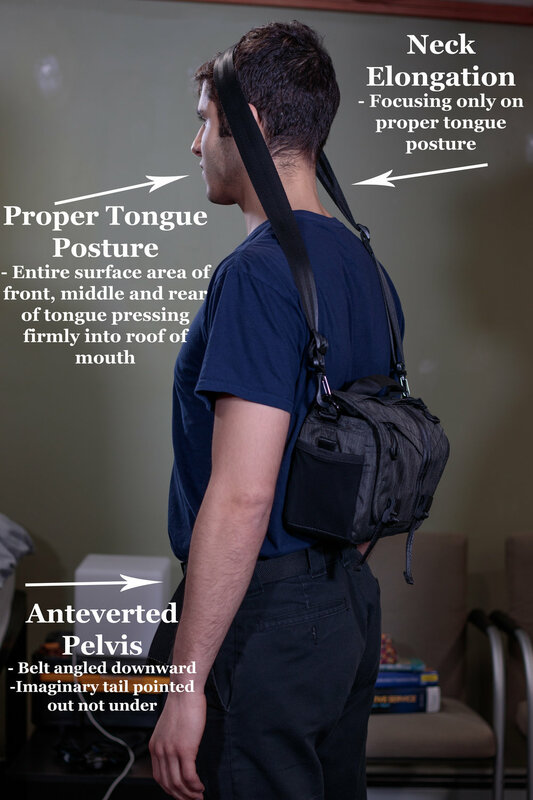 With a tremendous amount of effort I developed a maneuver in which I could hold my neck in a rigid and sturdy position to protect it during strenuous activity. Basically, I would concentrate intensely on muscles deep inside my neck and engage them. To give you a better sense of what I was doing, imagine that someone were to take a handful of hair at the back of your neck and pull it up toward the sky. That was the direction of the movement I practiced in order to protect my neck. I really went all-in trying to master this neck elongation. One of my favorite exercises was slinging a shoulder bag across my head and walking around Cambridge for the evening. With weight on the head, you either engage the neck muscles or suffer injury. The weight forces you to elongate. It's a great way to train. But unlike pelvic tilting and spinal elongation, I could never make this neck elongation maneuver second nature. As soon as I stopped paying attention, the posture would collapse. Any activity that required its own attention such as my auto mechanics work or difficult computer tasks pulled me off of it. I couldn't hold this neck posture while talking or eating, and certainly wasn't elongating my neck during sleep. 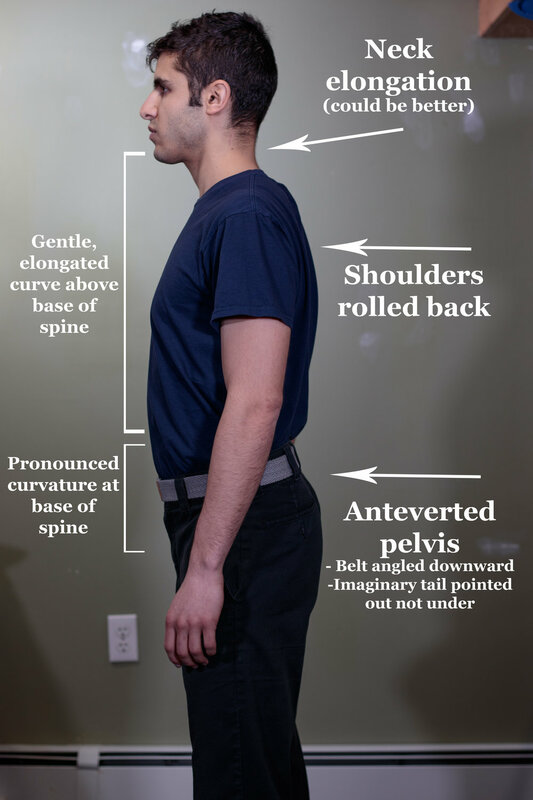 Just this past month I finally figured out why elongated neck posture has eluded me. 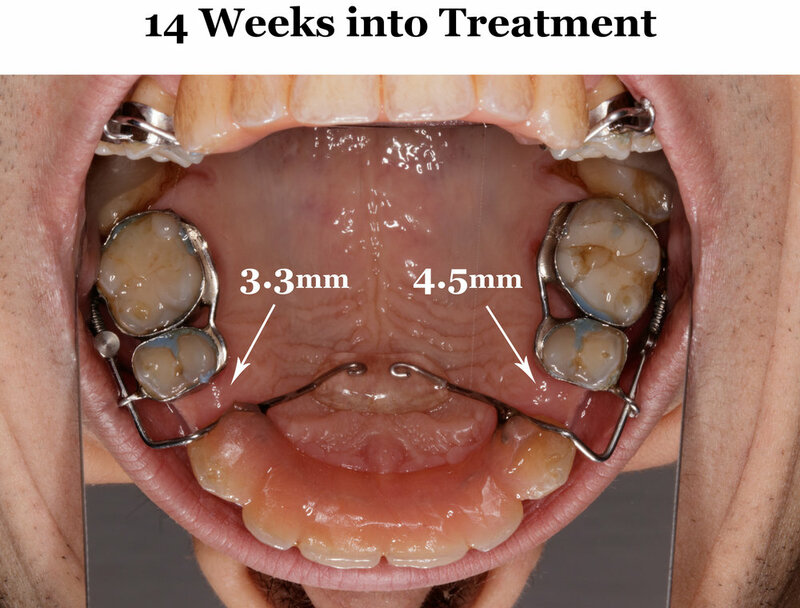 I solved the riddle after experiencing roughly 4.5 millimeters of forward growth in my maxilla thanks to Dr. Leonard Kundel and the Anterior Growth Guidance Appliance. This 4.5mm of forward growth allowed my tongue to come out of my throat and spread across the roof of my mouth as it never had before. I had been aware for at least 3 years of the concept of proper vs. improper tongue poster, even though Esther Gokhale never mentions it in her book. Basically the idea is that at all times you want to press the tongue firmly onto the roof of your mouth rather than rest it on your mouth's floor. Keeping the tongue on the palate facilitates the habit of nasal breathing and allows the tongue to play its critical role as a natural palate expander. But there are right and wrong ways to "press the tongue onto the roof of the mouth." The wrong way is to press only the tip of the tongue onto the maxilla. The right way is to paste the full width of the front, middle and rear of the tongue onto the palate. There are 2 very common structural shortcomings that make it impossible to assume proper tongue posture. 1) Tongue-Tie - This is a condition in which the frenum of tongue is attached too close to the tongue's tip and anchors the tongue to the floor of the mouth, restricting its range of motion. Tongue-tie can prevent the anterior (front) and, more insidiously, the posterior (rear) of the tongue from easily making contact with the maxilla. 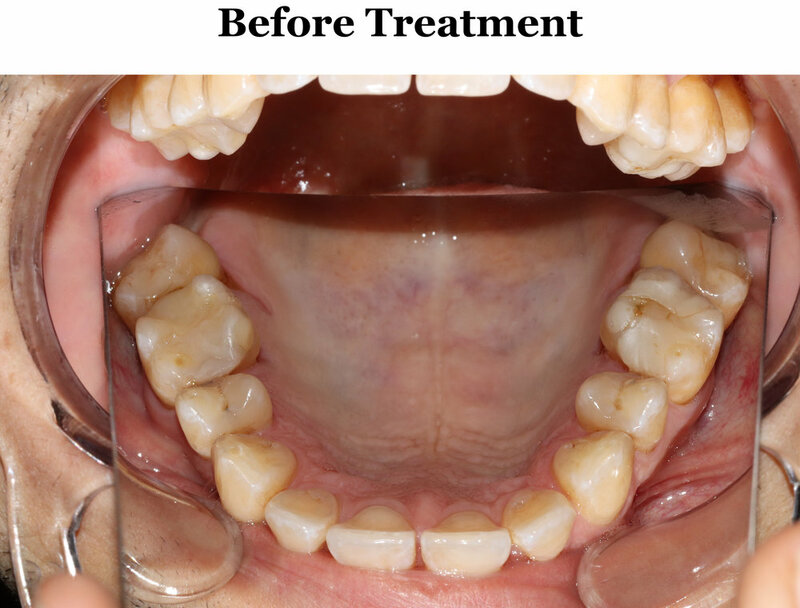 Dr. Kundel released my tongue-tie in June 2017 which resulted in a huge increase in my tongue's range of motion. 2) Undersized Jaws - But even after my frenectomy, I still could not assume proper tongue posture. This is because my mouth was too small to accommodate my tongue. With undersized jaws, it is only possible to place the tip of your tongue onto your palate. If you try to bring the posterior part of your tongue up onto the maxilla, the tip of your tongue will slide right through your front teeth. There's just not enough space in there. With undersized jaws, your tongue is like a cobra trapped in a shoe box. Actually, after 15 weeks with the Anterior Growth Guidance Appliance my mouth is still not big enough to fully accommodate my tongue. In the photo below I am bringing the rear of my tongue as far forward and up as it really wants to go, and spreading it firmly across my palate. You can see that when I do this, the front of my tongue comes through my front teeth. Several more millimeters of expansion are needed before optimal tongue posture can occur. But the 4.5mm of forward growth that I have now is enough space for my tongue to press into my palate in a way that is exponentially better than before. And what I have discovered is that proper tongue posture is the missing link to the neck posture conundrum that has puzzled me for at least 5 years. When I firmly pasted the full width of the anterior and posterior of my tongue onto my maxilla, I discovered that my neck felt tremendously strong and rigid. Normally to feel such a level of neck integrity, I would have to devote lots of concentration to engaging muscles deep in my neck, as I described above. But now I just focus on my tongue posture which is a lot more natural and effortless and provides even greater levels of neck strength and elongation. Presently I'm working to flesh out an anatomical explanation of why this occurs. If you Google images of muscles that attach to the tongue, you will see that there is an overwhelming amount of interconnection between the tongue, neck, back and sternum. My hypothesis is that pressing the full surface of the tongue firmly onto the maxilla engages certain muscles that connect the tongue to the spine. With these muscles engaged, there is a strong and durable direct connection between the upper spine, tongue and maxilla. 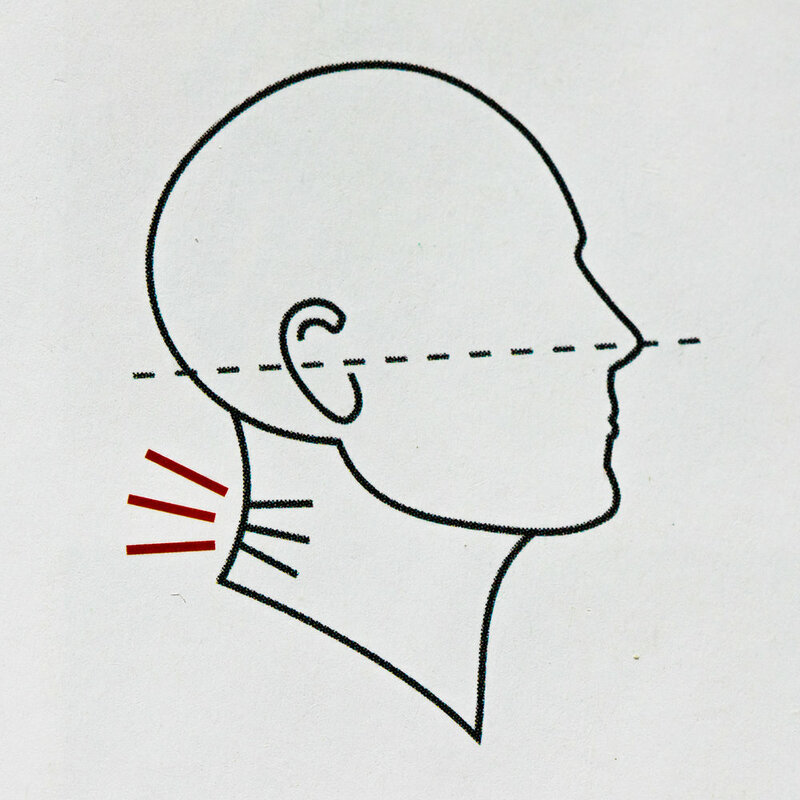 This connection stabilizes the cervical spine. Maybe it is something like a camping tent. With the tongue sitting on the floor of the mouth, the cervical spine is like a tent that is staked only in the back. But with the whole tongue firmly pasted on the maxilla, it is like a tent with stakes planted in the back, front and both sides. Such a tent is much sturdier in the wind. Whatever the physiological explanation may be, the pivotal role that tongue posture plays in neck posture is undeniable. Try it for yourself. Although if you are reading this blog there is a good chance that you are either tongue-tied or have undersized jaws and will not even be able to experience the full delight of proper tongue posture. Fortunately this can be fixed and all the resources to do so will soon be available on this blog. How Did Gokhale Miss Tongue Posture? Gokhale missed the link between tongue posture and neck posture in 8 Steps to a Pain-Free Back. But this omission, although it is hugely significant, does not take away from what is otherwise an amazing piece of work which for the past 5 years I have gifted more than any other book. For what it's worth, here are some explanations of why Gokhale may have overlooked tongue posture even though it was sitting right under her nose. Esther Gokhale devised her primal posture theory by observing and photographing others. In most cases, she probably didn't even speak the language of the people she was documenting. She simply reverse engineered good posture by observing people who had it. Well, tongue posture is mostly invisible to an outside observer, so it's understandable that it went undetected by Gokhale and her camera. Many people establish good tongue posture during infancy and as a result develop a robust facial structure that supports proper tongue posture for the rest of their lives. For such people, proper tongue posture is so second nature that they probably can't imagine its absence. They can't fathom having a mouth so small that proper tongue posture isn't even possible. Based on photos of her, I think Gokhale has pretty good facial development and may have had proper tongue posture since infancy. This also seems to be true for her photographed subjects who exemplify primal posture. Did Esther Gokhale take her own good tongue posture for granted? 3) Even Most Dentists Don't Have an Eye for Tongue Posture! Even most of organized dentistry is not conscious of the complex interplay between tongue posture, facial development and neck posture. Most dentists aren't aware that the tongue is supposed to function as a natural palate expander, and that poor tongue posture during infancy can result in atypical facial development that leaves you stuck with poor tongue posture for the rest of your life. And of the few dentists who are conscious of tongue posture and facial development, only a tiny fraction are aware of the modern tools and techniques that can be used to grow the jaws to give the tongue the space it needs to assume proper posture. I live in the Boston area which offers some of the best, most high-tech medical care in the known universe. And yet I have to travel 3 hours to Connecticut to see Dr. Kundel who is the only dentist in driving distance who is aware of these issues and is skilled in the use of the Anterior Growth Guidance Appliance. So how can we expect Esther Gokhale to nail down the relationship between tongue posture, facial development and neck posture if most trained doctors of the oral cavity do not?